Kid's (2.5m) speed skipping ropes. for skippers in the approximate height range of 4’ 11" to 5’ 4" (1.48m to 1.63m). Designed and used for training young skippers in skip-hop skipping workshops. first choice for schools and sports clubs for children throughout UK and Ireland. Perfect for all skipping tricks and skills - If you can do it this rope will help you do it better! The 2.5 meter version of our speed skipping ropes was designed for use by children in the approximate height range of 4’ 11" to 5’ 4" (1.48m to 1.63m). 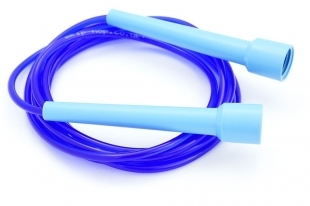 Used during our skip-hop workshops where we cannot be let down by our equipment the skip-hop 2.5m skipping rope does it's job every time and used properly will last forever! Weight, balance, shape, rope diameter and density have all been considered and adjusted to produce a very high quality skipping rope that really works!!!! Low friction stops on the end of the rope rotate in the handles for a VERY fast turning skipping experience. This makes the 2.5m speed skipping rope the perfect rope for children and young adults ( or adults under 5'4") to learn with it is a no fuss skipping rope that does it 's job beautifully.